I’m excited to see the Midsouth region of Ecclesia taking shape. When we began church planting in Austin in 2008, we were a small dot in a large gap between two coasts on the Ecclesia map. In the time since, we’ve seen more dots appear on the map, but of special interest to me have been those here in Texas, giving meaningful proximity to the relational emphasis between churches in Ecclesia. To celebrate and announce our emerging presence in this part of the country, we hosted our first Ecclesia regional event, which was co-sponsored by the Missio Alliance on October 5-6. The event was held at Space12, a community center in East Austin which is managed by Vox Veniae, and hosts ongoing non-profit and local community events. 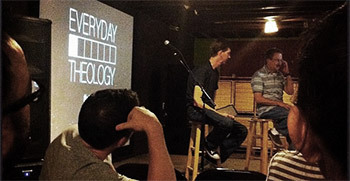 The event was built around the theme of Everyday Theology. Dr. Roger Olson, of Truett Seminary and the Missio Alliance, began our time together with a lecture on the nature of, and the need for, everyday theology — recognizing how a robust theology relates to the activities that fill our daily schedules. Following Dr. Olson’s lecture, twelve practitioners gave 15 minute presentations on how theology informs particular practices and cultural artificats. JR Woodward joined us from Hollywood, while the remaining presenters represented eleven different church communities from San Antonio and the greater Austin and Dallas areas. This was a similar format to previous Ecclesia events in the western region, and served just as well to give space to hear many different voices. As I hoped and expected, the event was marked by thoughtful presentatations and rich dialogue. But the most encouraging thing to me came out of the conversations in the moments after the event and in emails to follow. Former strangers were making plans to connect, to meet face to face to learn more from mutual experiences or scheduling phone calls to continue conversations began over our Asian fusion lunch. Seeing churches and leaders from many backgrounds and contexts finding common space to learn from and encourage one another resonates with what Ecclesia is about, and it was a beautiful beginning for this budding region.